At the beginning of the month, I posted some photos of "grassroots" RX7 drift cars from Japan and the USA. Now, I'm going to continue with some shots pro-spec rotary drift cars at D1 events on both sides of the pacific. I wish I could say that I was around to shoot some of the cars from D1's "glory days" (Haruguchi FC anyone? ), but I was a high school student during that time! Nonetheless, there are still lots of cool RX7's and the occasional RX8 seen in D1 these days. 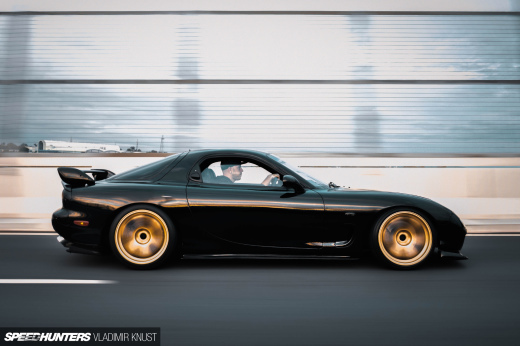 Drift Samurai and his FC3S have been fan favorites in D1 for some time now. Halfway through the '08 season, the car got repainted blue to match the rest of the Team Toyo members. 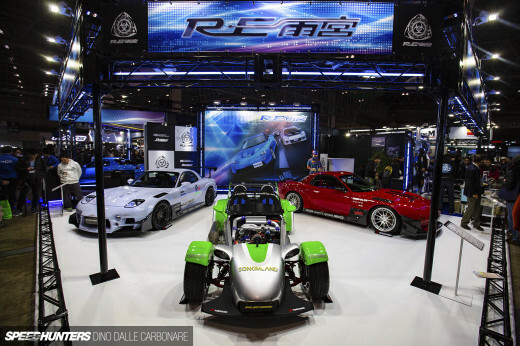 The shot above was taken at the D1GP Odaiba event, when the car was still yellow with the Autobacs Secohan graphics. The NKB FD3S takes the "best sounding" award among the current D1 field thanks to its 650hp turbo three-rotor. Now for a US-built car, the Falken RX8 driven by Seigo Yamamoto in D1 and Formula D. I can't recall hearing anything about this car recently, anyone know of its whereabouts? This was one my favorite American pro drift cars. Masao Suenaga's FD3S at Irwindale in 2006. And again at Fuji Speedway during the '08 D1 finale. As you saw in my Tokyo Auto Salon coverage, this car has a new sponsor and new paint scheme for 2009. 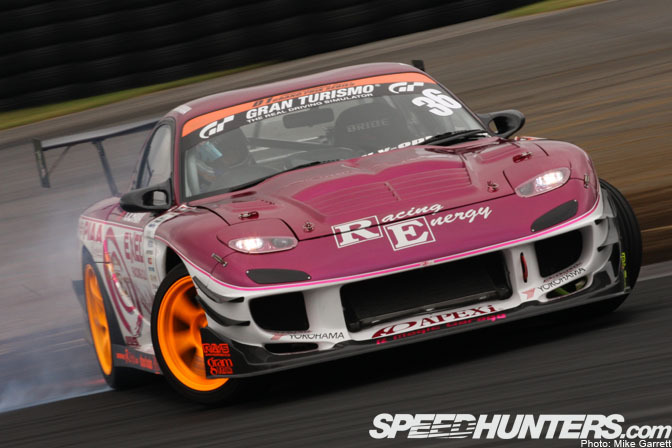 Tsutomu Fujio's wide-body R.Y.O FD was another one of RX7's active in D1 last year. Kenji Takayama has been piloting rotaries in D1 for a while, first in his orange FC3S and starting last year in the R-Magic FD. Another view of Drift Samurai's FC making a huge cloud of smoke during a perfect qualifying run at Fuji Speedway. He had some nice performances last year, so maybe '09 will be the Samurai's time to shine? Manabu Fujinaka's 3-rotor beast in action. More R-Magic and Takayama. I think I'm gonna have to make desktop of this car before the month is up. 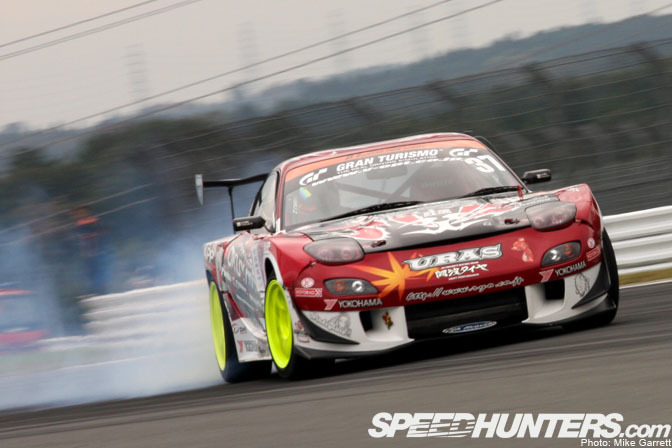 And finally, a slow shutter shot of Masao Suenaga's FD during the '08 D1 closer at Fuji, which he would go on to win. What about D1SL? I love the RX8 that runs in that series. I vote for Nomuken or Ueno for champ in '09. Who knoes tho, Kuma could come out crazy with the EVO X and kill everyone. the rx driven by seigo got destroyed at formula D new jersey. it wasent blue..had been painted black and red. JIC Japan has their RX8 that has been competing for a while also. I think that deserves some recognition too. Although they don't do THAT well, that RX-8 was one of the first of its kind. That US Built RX-8 is now a time attack car and never had a chance to shine in Drifting. 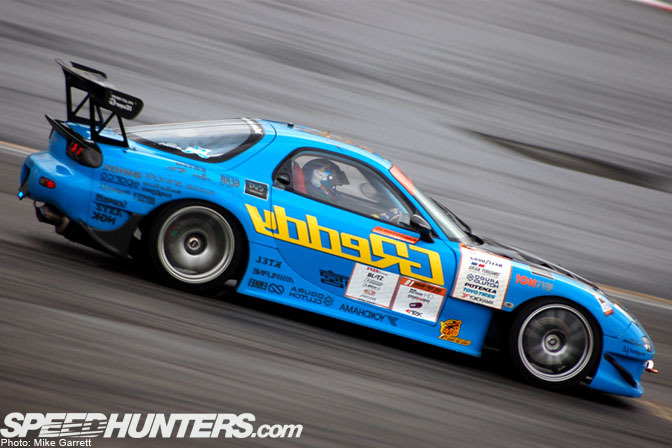 However, JIC did help Rod Millen build his D1GP RX-8 that was out in 2006 season. Now Tony Angelo drives it. Desktop request for that first shot of Masao at the beginning of this post. The angle of the car in that picture looks great with the full counter-steer! I thought the BRS car just got a little nick are irwindale? AND SERIOUSLY, YOU GUYS FORGOT ABOUT TONY ANGELOS RX8, PAINTED IN THE GREEN AND ORANGE MAZDA LEMANS COLORS!!!! That last photo doesn't only look slow shutter. It just looks plain out of focus. To all those who wanted to see Mad Bull or Tony Angelo; this is a D1GP rotary post after all. Whatever happened to the orange FD driven by Masatoshi Asamoto when he was part of team orange?